Introduced in 2004, the Data Distribution Service™ (DDS™) has developed into a mature and proven connectivity standard within the Industrial Internet of Things (IIoT) Today, DDS is at the heart of a large number of mission- and business-critical systems such as: Air Traffic Control and Management, Train Control Systems, Energy Production Systems, Medical Devices, Autonomous Vehicles, and Smart Cities. Considering the technological trends towards data-centricity and the rate of adoption, DDS will soon be integrated into ever expanding array of Industrial IoT (IIoT) systems. To help you become an expert in DDS and increase your skills in the growing DDS market, Object Management Group®(OMG®) offers this three-part DDS technical overview webinar series (1) the essence of DDS and data-centric systems, (2) how to effectively exploit DDS Quality of Service to build applications that perform and scale, and (3) securing your distributed DDS system. 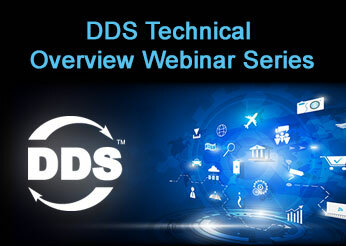 This first instalment of the OMG DDS Webinar Series will get you started with DDS. We will (1) cover in great detail DDS’ key abstractions, (2) introduce the essence of DDS-based data-centric and modular architectures, and (3) clearly position DDS with respect to messaging technologies. After attending this webcast you will know the fundamentals required to start using DDS in your next project. Traditional approaches to developing high-performance distributed systems have relied on low-level messaging technologies. This increases complexity forcing the application (or a custom-developed framework) to perform many tasks beyond the focus of the application itself. For example: state management, detecting component presence and network connectivity, ensuring reliability and availability of the information, managing component failures, and so on. Most of this complexity is avoidable if you use DDS. The second installment of the DDS Webcast series will cover in detail the mechanisms available in DDS to meet challenging real-world application requirements. From discovery to state management, information consistency, data durability, reliability and scalable information distribution. With over 20 different quality-of-service (Qos) policies DDS provides ready-made configurable patterns that can be used to meet most of these use-cases. Learn to leverage DDS Qos and patterns to simplify your application code and increase the robustness of your system. Today’s connected systems are seeing increasing risks to cyber attacks, including Denial of Service (DoS), Man in the Middle, and Eavesdropping. Most companies have an IT department responsible for cyber security. However, operational systems have different components, different network connections and behaviors, and different cyber threats than typical enterprise systems. The third installment of the DDS Webcast series will take an in-depth look at the latest advances in the DDS standards to meet the demanding cyber-security requirements of today’s industrial connected systems. From authentication and access control to integrity and encryption, learn how to leverage DDS Security features to secure your connected system against cyber attacks, while maintaining a flexible, scalable architecture.